This course covers assessment practice during crisis situations, working with suicidal clients, documentation of accepted protocol, diagnosing post-trauma clients, helping children who have experienced crisis, and provides a model for making difficult ethical decisions. Identify ethical dilemmas unique to crisis counseling. Understand how to minimize liability in high-risk situations. Develop critical crisis management plans and implement post-crisis resolution strategies. 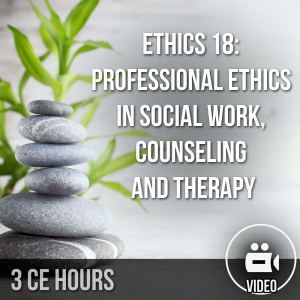 The purpose of this continuing education course is to provide a current understanding of issues relevant to the mental health counselor concerning providing ethical treatment in times of crisis. This course covers assessment and diagnosis practice, working with suicidal clients, documentation of accepted protocol, post-trauma clients, children who have experienced crisis, and provides a model for making ethical decisions.